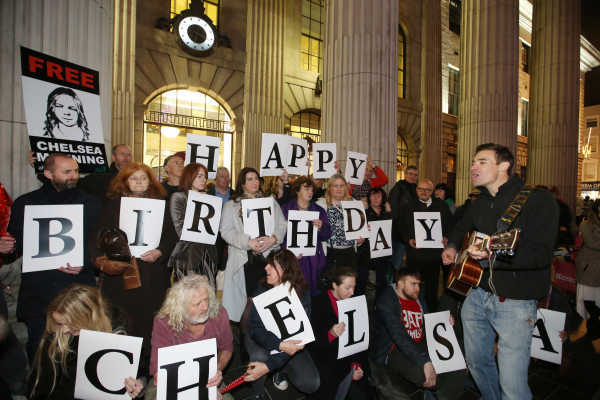 TDs, Senators and human rights campaigners will gather outside the Dail today at 4pm for a photocall with a birthday cake and candles for imprisoned U.S army whistleblower Chelsea Manning, hosted by Senator David Norris. Manning marks her 29th birthday on Saturday December 17th. It is set to be her 7th birthday and Christmas in prison. Irish supporters joining global calls for President Obama to pardon Manning include Afri, Amnesty International Ireland, TDs Mick Wallace, Joan Collins, Maureen O’Sullivan, Catherine Murphy, and Clare Daly, Senators David Norris and Alice Mary Higgins, member of the Council of State Ruairi McKiernan, and actor and playwright Donal O’Kelly. “The information that Manning gave to the public exposed the torture and horror of Guantanamo Bay. It showed us the true human cost of the wars in Iraq and Afghanistan, and changed journalism forever. Chelsea Manning told us what we deserve to know. Obama now has a chance to do the right thing and pardon Chelsea Manning before he leaves office next office month. If he does not, it will be another stain on his legacy forever” said Joe Murray, Director of Afri, a justice and human rights organisation. Manning, whose grandfather came from Dublin, has been sentenced to thirty five years after leaking information on U.S military abuses while serving as an intelligence analyst in Iraq. These included the famous Collateral Murder video that exposed the killing of unarmed civilians and two Reuters journalists by a US Apache helicopter crew in Iraq, the Afghan War Diary that revealed investigated civilian casualties and contractor abuse, the Iraq War Logs that revealed civilian casualties and contractor abuse, and US diplomatic cables that revealed the role that corporate interests and spying play in international diplomacy. Manning has been incarcerated since May 2010, in addition to almost a year in solitary confinement before her trial. A new White House website petition of over 100,000 signatories is calling on President Obama to release Manning for time served, which they say is more than any other person who has ever disclosed information in the public interest. Although Private Manning continues to write for The Guardian and other media she has also attempted suicide twice this year and is being punished with additional time in solitary and is facing an extended prison sentence. Her work has led her to receive the Sean MacBride International Peace Prize, the Sam Adams Award for Integrity in Intelligence and to be nominated for a Nobel Peace Prize. “Every now and then you do come across a significant choice. Do you really want to find yourself asking whether you could have done more, 10-20 years later? These are the kinds of questions I didn’t want to haunt me.” Manning recently said in an interview with Amnesty International.